An abstract is a complete record or transcript of all documents filed of public record affecting title to a certain real property. It must be certified by a licensed and bonded abstractor to a particular date and time. As an abstract company, we are bonded and regulated by the Oklahoma Abstractors Board. It is important to note that in Oklahoma, no title policy may be issued without first having a currently certified abstract examined by an attorney licensed in Oklahoma. 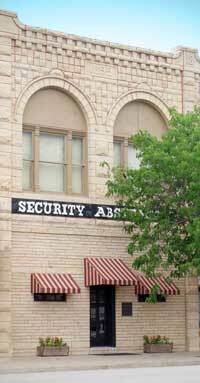 Security Abstract Company, located in Newkirk, directly across the street from the Kay County Courthouse, maintains title plant records for all properties located in Kay County, Oklahoma. A 2004 major renovation and expansion, prompted by growth and technological advancements, resulted in an inspiring workplace environment, extremely well-suited for title production. We have our own records index system that has been updated daily since the opening of the Cherokee strip in 1893. The integrity of these records provides the basis for researching “chains of title” and ultimately being able to issue accurate, high quality abstracts and other title products.